The god Innoruuk, self-titled Prince of Hate, dares you to enter his domain. Better yet, he invites you! Without intruders to tease, test, and slaughter, the inhabitants of his realm must turn to the only other form of entertainment available: slaughering one another. Of course, Innoruuk encourages this behaviour too, for brother fighting against brother presents plenty of amusement, but it's much more fun for him when hapless do-gooders fall into his clutches. Will true heroes of Norrath stand idly by while Innoruuk plans his next conquest? 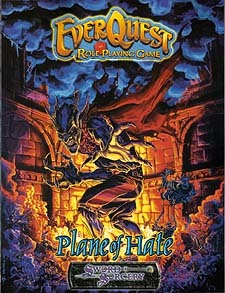 All the material included in Plane of Hate is 100% compatible with 3.5 edition fantasy role-playing rules. This book presents the entire Plane of Hate, extra-dimensional domain of the dark, hateful god Innoruuk. Mapped and described in detail, this plane is a challenge for even the most capable characters, and any who would venture here are encouraged first to acquire some of the vast powers described in Heroes of Norrath, another EQrpg role-playing supplement available now. This book contains statistics for all the major inhabitants of the plane, including Innoruuk himself, as well as a detailed history of the dark elf race - and how it was created from a vengeful god's twisting of the high elves' erstwhile king and queen.